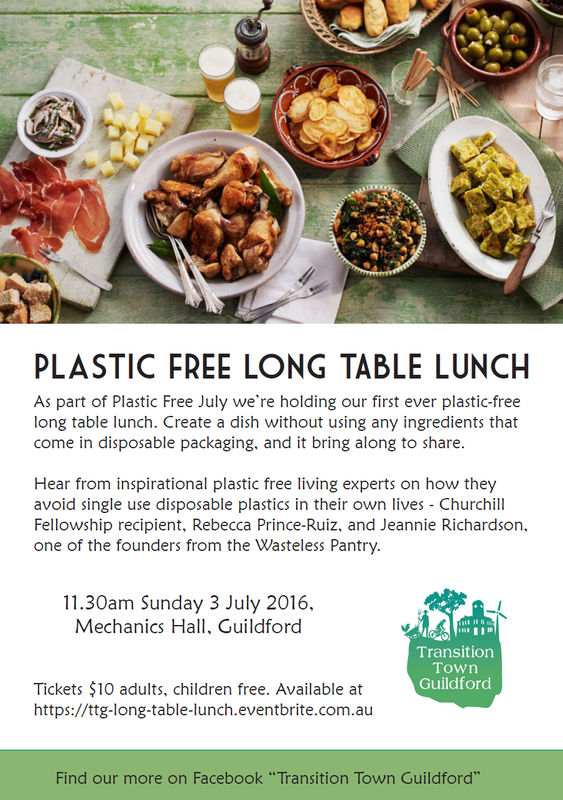 Join Transition Town Guildford for our first ever long-table lunch with a difference – it’s plastic free! Doors open at 11.30am. Lunch kicks off at 12.30pm! Nibbles/hors d’oeuvres, tea/coffee and entertainment will be provided. Cost: $10 for adults, Children are free. Make a dish to share (either savoury or sweet) and bring it along with your own plate, glass and cutlery to the Mechanics Hall in Guildford (next to the Post Office). The challenge is to prepare a dish using ingredients that don’t come wrapped in single use disposable plastic. Also look for ways to transport your dish without using single use plastic like gladwrap and plastic bags. If you were unable to avoid any use of disposable packaging to make your dish, bring your items along to join the display of dilemma bags, so we can start up conversations and share ideas on how to reduce plastic/single use packaging use. Please remember: This is not a competition! It’s just a simple exercise in recognising the pervasive nature of single-use packaging in modern life. While we enjoy our plastic free lunch, you will hear from inspirational Plastic Free Living experts on how they avoid single use disposable plastics in their own lives. Our guest speakers will be Rebecca Prince-Ruiz, the creator of Plastic Free July Challenge and Jeannine from the Wasteless Pantry. How to get to the Plastic Free July Long-Table Lunch? The easiest way to get to the long-table lunch is via the train. The Mechanics Hall is only a short walk from the Guildford train station. Alternatively, there is limited parking at the venue and plenty of parking available at the train station (you can park there for free). We encourage you to consider taking the train or car pool with friends to minimise your ecological impact! The May event for the Transition Town Guildford Sustainable Homes action group will be another house tour and it’s an owner retrofitted house with a veggie garden. This house has simple readily available design features. If you are looking to make your own older style home more sustainable check out this great little house for good practical ideas. Sustainable refurbishment of a two bedroom duplex which demonstrates that it is possible to buy low cost housing and renovate on a small budget to create a living space that is comfortable and environmentally friendly. They have kept most of the duplex intact, recognizing the importance of embodied energy in the existing structure. The home is orientated to the NE using LowE glazing to maintain energy efficiency. Polished concrete floors next to the North facing windows absorb heat in the winter. External shading keeps sun off the NW windows. The home uses barred louvres to allow safe night time ventilation. The home also features SHW system, rainwater tank & re-use greywater. The home has natural lighting, due to a roof window, that is important to how the home functions. Following movie nights, we always like to give people avenues for action if they are interested. 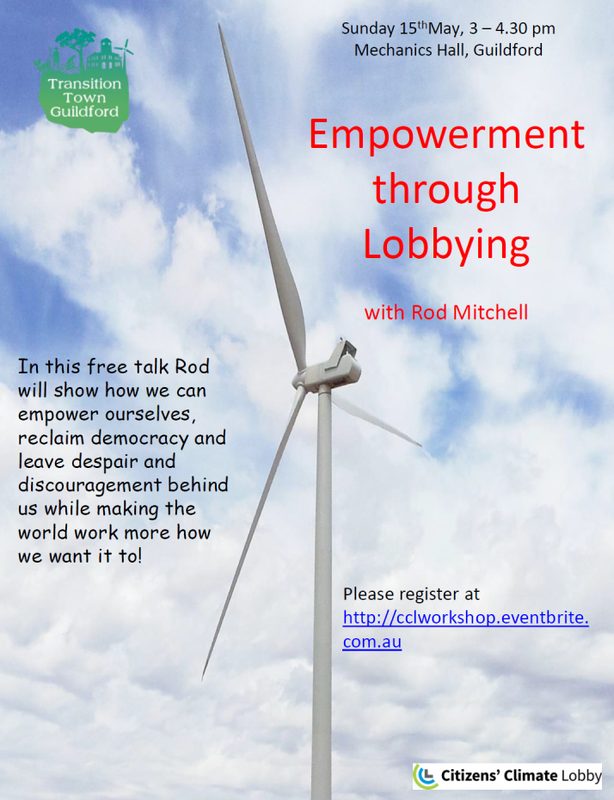 So after this months movie – Merchants of Doubt – we’ll be hosting an Empowerment Through Lobbying workshop by local and TTG co-founder Rod Mitchell. Rod is the National Coordinator of Citizens’ Climate Lobby Australia. In this free talk Rod will show ho we can empower outselves, reclaim democracy and leave despair and discouragement behind us while making the world work more how we want it to!